A group of friends, a disc of anime, a bottle of wine...better make it two. We're an anime podcast taking a look back at some older anime titles on physical media, and seeing if they still hold up or not. Sometimes time lets us appreciate overlooked titles, while other instances require us to remove those rose-tinted glasses. So grab a glass of wine and have a listen. A group of friends, a disc of anime, a bottle of wine... Better make it two bottles. 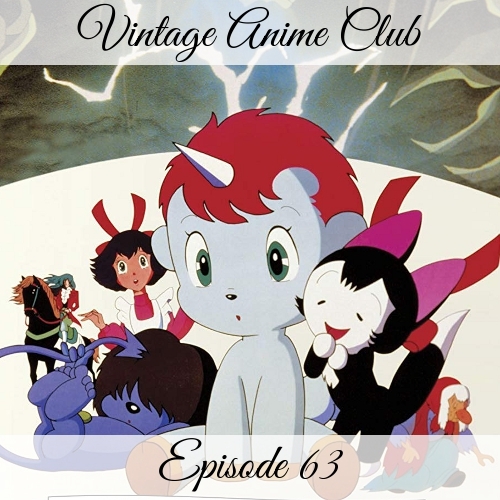 On this episode, Karen, Ed, Dennis, and Kate help you relive some of your supposed repressed childhood memories as we go over 1981's The Fantastic Adventures of Unico. How could an adorable baby unicorn cause so much trauma? Osamu Tezuka, that's how. We'll go over comparisons to Fantasmic, can horse hooves really do that, tsundere demons, and staying away from strangers' drinks. Support the show by purchasing the Unico Double Feature through our Amazon or RightStuf affiliate links!